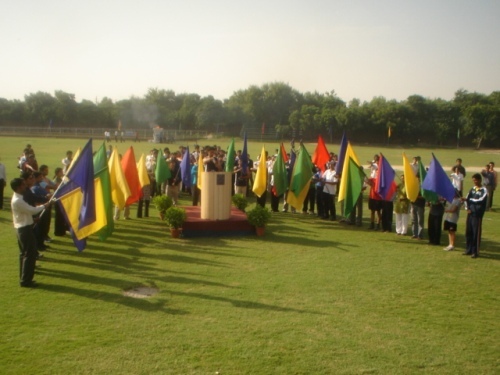 Amity is the abode of culture and traditions and is known for its tradition to celebrate the birthday of Dr. Ashok K. Chauhan, Founder President, Ritnand Balved Education Foundation (RBEF) in the form of a month long mega event “Sangthan 2006- Inter Institutional Sports Meet” every year. 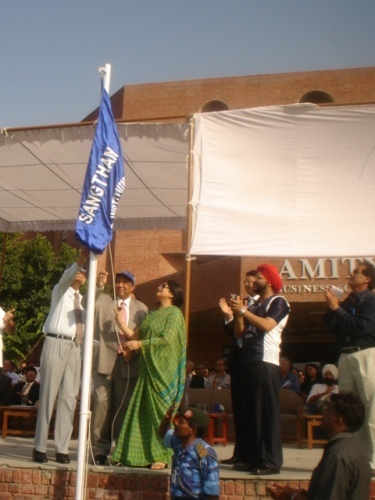 This year’s “Sangathan” was declared open with a flag hoisting by Dr. Ashok K. Chauhan, Founder President, Ritnand Balved Education Foundation, Dr. (Mrs.) Amita Chauhan, Chairperson, Amity International Schools, Mr. Atul Chauhan, President, Ritnand Balved Education Foundation at Amity Campus, Sec-44 Noida amidst various institutional heads and enthusiastic students from the primary, secondary and the higher education institutes of Amity. Addressing the enthusiastic gathering, Dr. Ashok K. Chauhan, Founder President, RBEF said that a healthy mind stays in a healthy body so events like “Sangathan” really helps in bolstering up the body as well as the mind. He congratulated the students who were to participate in the football match. 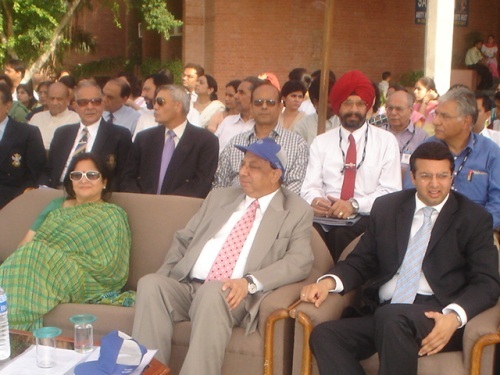 Mr. Atul Chauhan, President, RBEF and Chancellor, Amity University UP in his inaugural address said that it’s really nice to see students from all the campuses gathered under a single roof, keen to participate in an event which is organized to celebrate the birthday of Founder President. This not only shows students’ regard and respect for the Founder but also their adherence to culture and traditions. The ceremony saw the torch bearing procession by students which culminated in the lighting of the flame. 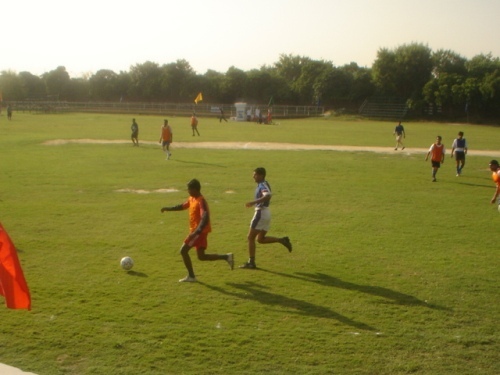 The oath ceremony was followed by a football match (men) which, was kicked off by Mr. Atul Chauhan. The two teams of Amity Institute of Telecom and Amity Institute of Fine Arts ferociously competed with each other with a fire in their belly and hope in their eyes to win. Dr. Gurinder Singh, Chairman of organizing Committee “Sangathan- 2006” declared that over 3000 students will give a tuff competition to each other in this month long event which will comprise of a multitude of games like Cricket, Football, Basketball, Hockey, Volley Ball, Table Tennis, Lawn Tennis, Badminton, 100 Meter Race, 200 Meter Race, 400 Meter Race, Shot Put, Discuss Throw, Swimming, Chess, Carrom Board, Squash, Long jump. Students from all the Amity Campuses- Jaipur; Raipur; Lucknow and Bhubaneswar along with their Delhi counterparts presented a perfect picture of the diverse culture of the Country. The occasion was graced by many senior officials and institutional heads of Amity.